Having missed our great win against Southampton while i was in Vegas (post to follow), i travelled to Upton Park with slight trepidation, as i had also heard that we were extremely poor against Wigan. Man City came to this game with a run of so so results and probably felt this would be a game where 3 points were a formality. This was backed up by team selection, with Mancini starting Tevez, Balotelli, and Edin Dzeko all up top. West Ham put out probably their best starting 11, with Benayoun and Jarvis starting. Collins got a bit of rough reception from the home crowd when announced. Tomkins wasn’t even on the bench, and O’Brien came in at right back. The game started as you would imagine with City moving the ball around, West Ham picking up scraps. However my main fear hadn’t materialised as Silva wasn’t playing, and the City midfield was not as quick and agile as i expected. West Ham played themselves into the game with Diame and Noble starting to take charge with some real blood and thunder tackles. Then the potential turning point occured. Kevin Nolan scored a goal from close range that was ruled for offside. Turns out the goal was ruled out wrongly. I haven’t seen the evidence myself but every report seems to back this up. This shook up City however, and from then on for the first half WHU were on top ,with Benayoun hitting the Bar, and Carroll going close. City had their chances however, but most of them fell to Balotelli, who frankly was useless. This guy has all the talent in the world, but his laziness and refusal to go for any ball that isn’t already on his foot, would frustrate the hell out of me. No changes for the second half from either team, and no change on the pitch, with City having a shade on possession but WHU keeping their hand in, and once again Carroll went close with a spectacular overhead kick. City didn’t get te chances they had in the first half, but the ones they did fall to Tevez, who knowing his place at Upton Park, did his best to miss ! West Ham battled on and some good subs by Sam to get Diame off before he was sent off, and a late sub of Collins to give Jordan Spence some game time worked. Collins to be fair had made some great blocks, and tackles and hopefully has redeemed some of the ill will of the WHU faithful. 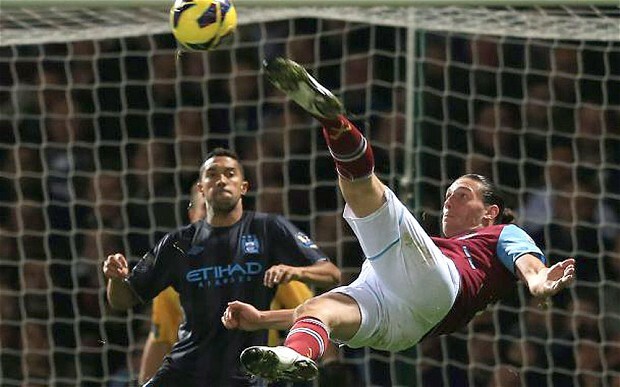 The game ended 0-0 and it really was a point earned by WHU, and 2 lost by City. I’ll take that. On leaving the ground, as usual we ended up with the away fans , and i heard some interesting comments. They thought we put 11 behind the ball, and this is what always happens to City on the road. What nonsense ! We had as many scoring opportunities as them and really gave them a game. The more telling comment was from a young girl, who said that if it had been United rather than City, they would of got the win. This is because United are a team, and City are a group of talented players, who struggle to play as a team when the going gets tough. Witness their CL performances in the last 2 years. This is a trate of Mancini, see no further than his tenure at Inter. He needs to get rid of Balotelli pronto, and push Yaya Toure further up the pitch. Last time we played City at home they won 3-1 and he ran the whole game. Yesterday, he was deep and ineffectual. I would love to say this was due to WHU pressure, but i will admit it was more likely to Mancini’s team selection and tactics. These City fans need to remember where they were 4 or 5 years ago, and not assume they already have a permanent seat at the top table of European football. All in all, a good day to build confidence for the Hammers, and keeps us in the top 10. MOTM. Reid and Collins were excellent, Noble and Diame threw themselves around. But for fitting straight back in and playing a full 90 with style and class, my award goes to Yossi Benayoun. AC goes close with a speculative overhead kick.